This book is not just a bargain, its a steal. Its filled with practical, workable advice for anyone wanting to build wealth.Mike Summey, co-author of the bestselling "The Weekend Millionaires Secrets to Investing in Real Estate," . Anyone who seeks financial wealth must first learn the fundamental truths and models that drive it. "The Millionaire Real Estate Investor" represents the collected wisdom and experience of over 100 millionaire investors from all walks of life who pursued financial wealth and achieved the life-changing freedom it delivers. This book--in straightforward, no nonsense, easy-to-read style--reveals their proven strategies. . .
"The Millionaire Real Estate Investor" is your handbook to the tried and true financial wealth building vehicle that rewards patience and perseverance and is available to all--real estate. You'll learn: . . . Myths about money and investing that hold people back and how to develop the mindset of a millionaire investor . How to develop sound criteria for identifying great real estate investment opportunities . How to zero in on the key terms of any transaction and achieve the best possible deals . How to develop the "dream team" that will help you build your millionaire investment business . Proven models and strategies millionaire investors use to track their net worth, understand their finances, build their network, lead generate for properties and acquire them. 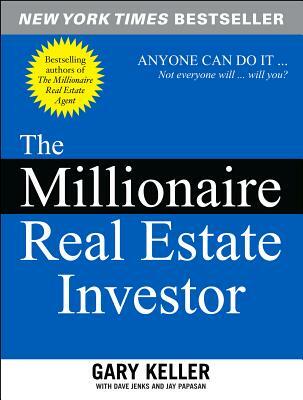 . .
"The Millionaire Real Estate Investor" is about you and your money. It's about your financial potential. It's about discovering the millionaire investor in you.. .
Gary Keller is a self-made multimillionaire and founder of Keller Williams Realty International, the fifth-largest and fastest-growing real estate franchise system in North America. With over 25 years of industry and investing experience, he's been involved in thousands of transactions. He is also the author of the best-selling The Millioniare Real Estate Agent.